No matter if it’s a first vacation with a new travel trailer, another day hauling waste from a job site, or taking the family and its toys out for some fun, following basic trailer towing safety tips is essential to arriving at your destination safely. In order to be fully equipped for safety: check your trailer from hitch to brake lights, inspect your towing vehicle, and alter your driving habits once you hit the road. Safe towing is a weighty issue – the weight of your trailer, its load, and the capacity of your towing vehicle. It is always important to make sure the weight of your trailer – fully loaded — does not exceed the towing capacity of your vehicle. Towing a trailer of any sort that is too heavy is a serious safety risk – making it very difficult to stop quickly and safely avoid road hazard. Towing a load that is too heavy can cause your engine to overheat and puts your tires at risk of a blowout. Check the Gross Vehicle Weight Rating (GVWR) — the combined weight of your own vehicle with the fully-loaded weight of the trailer – before hitching up. The GVWR of your tow vehicle is listed in the owner’s manual. The GTW is the weight of the trailer and its maximum load and that number can be found on the specifications for your trailer. Once the safe towing weight is established, make sure the hitch is up to the task. Hitches are rated for the weight they can tow and the tongue weight they can bear. The tongue weight is the amount of weight that bears down on the trailer hitch. Too much weight on the tongue can cause unsafe towing conditions and affect vehicle’s steering. Make sure the hitch is in good repair and includes safety chains, crossed under the hitch with enough slack to turn, but not so much that the chains drag on the ground. Check all electrical connections in the wiring system to be sure they are clean and in working well. Before heading out, it’s also important to check to make sure that the trailer’s brake lights and signals are in good working order. It is also very important to always make sure that your towing vehicle is up to the task as well. 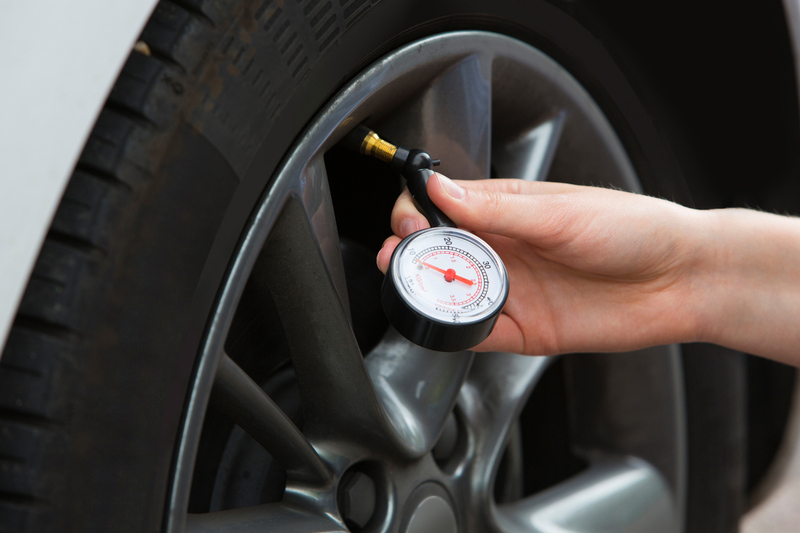 Check the tire pressure and fluids as towing will be hard on your vehicle so regular maintenance upkeep is critical. A large trailer may require larger rear-view mirrors or extensions that will allow you to see to the rear of the trailer. 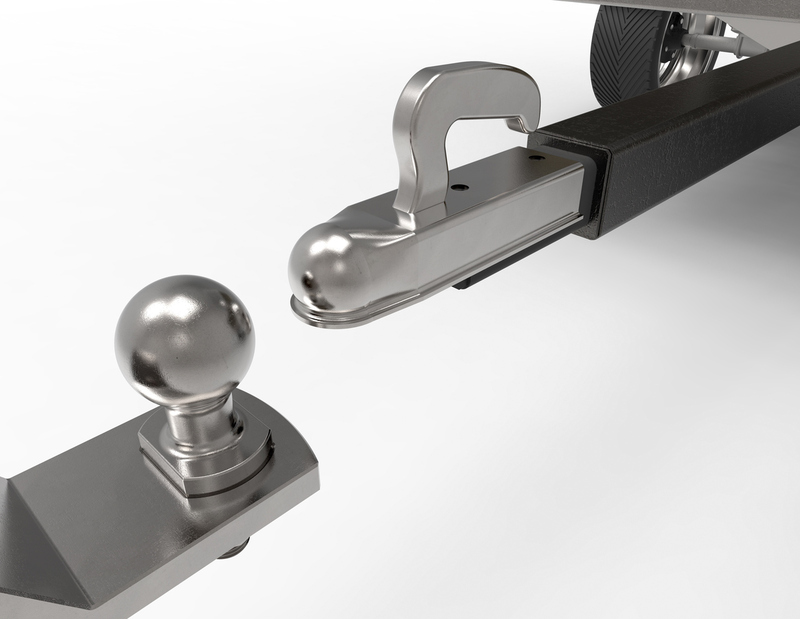 As you load your trailer, take care that the weight is distributed evenly front-to-back and side-to-side. An uneven load can cause sway and make it harder to control the towing vehicle. Secure all loose items in the trailer to prevent shifting during the ride. Before heading off, it’s a good idea to walk around the tow vehicle and trailer to make sure all is well. When hitched properly, with proper weight distribution, the vehicle and trailer should remain level. An suv with a matching silver trailer heads down the road. When you finally do hit the road make sure to put safety ahead of speed when towing a trailer. Maintaining a moderate, steady pace means less wear and tear on the tow vehicle, less chance of sway, and more time for you to react to road hazards should they arise. Avoid sudden stops that can cause the trailer to sway or jack-knife. 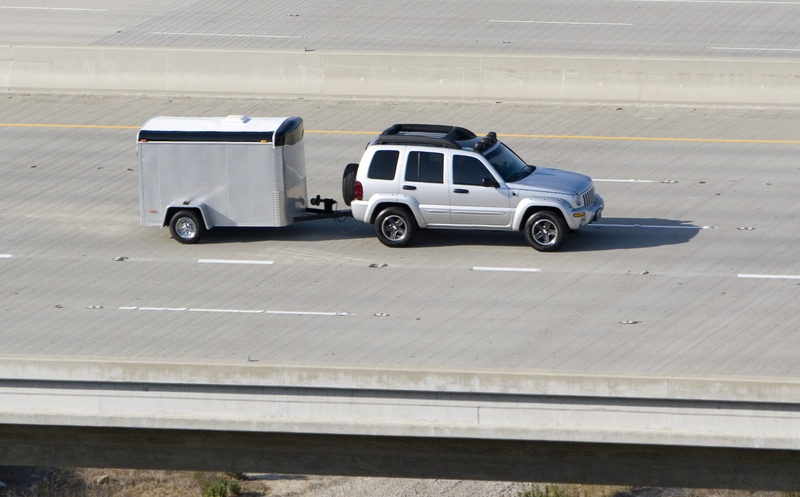 Avoid sudden turns and swerves that can cause the trailer to sway and the load to shift. Make wide turns at curves and corners. Because your trailer’s wheels are closer to the inside of a turn than the wheels of your tow vehicle, they are more likely to hit or ride up over curbs. Control swaying caused by air pressure changes and wind buffeting when larger vehicles pass from either direction, by releasing the accelerator pedal to slow down and keeping a firm grip on the steering wheel. Allow more distance for braking. When passing a slower vehicle, signal far in advance and be sure to leave plenty of room for the vehicle and trailer when re-entering the lane. Downshift to assist with braking on downgrades and to add power for climbing hills. On long downgrades, apply brakes at repeated intervals to keep speed in check. Don’t “ride” the brakes as that may cause them overheat. Anticipate the need to slow down. To reduce speed, shift to a lower gear and press the brakes lightly. For those new to towing, backing up and parking may be the most harrowing aspect of towing a trailer. Learning to back up and park a trailer requires practice, patience, and sometimes a partner. 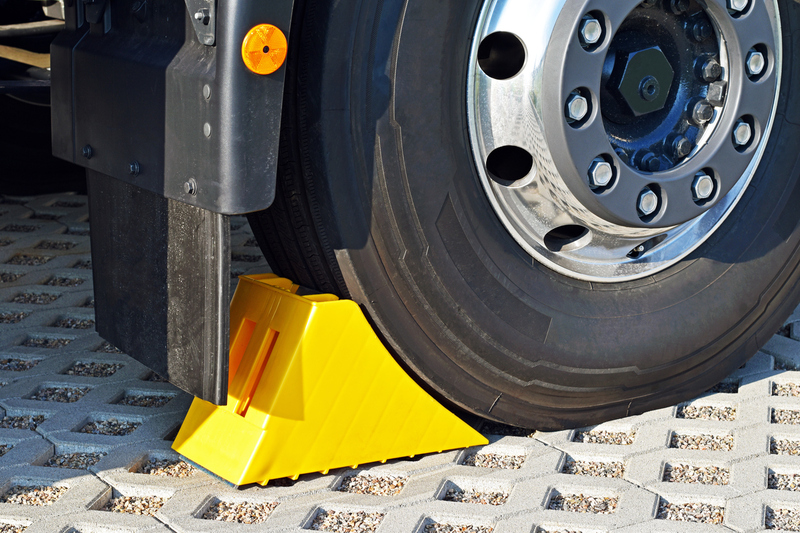 Once the trailer is situated, use chocks, or blocks, on either side of the tires to prevent rolling before uncoupling from the hitch.